- It should generate the entire way to work a possible linear driving force. - It must be thermally resistant and derive well the heat, which arises in the voice coil. - The variable component (the voice coil) should be as light as possible to reduce the inertia. By using the same two incredibly strong neodymium discs, which take the pole plate in a pincer, an enormously strong and homogenous magnetic field is generated. This is effectively screened out by the surrounding steel jacket. At the same time the massive jacket absorbs a big deal of heat energy and release it to the environment and the aluminum-cast basket. In the tweeter the heat capacity is increased by a machined aluminum body, which is thermally coupled with the woofer motor. Audio Consequence works with underhung engines, which means that the voice coil itself is short, the air gap with its magnetic field much more longer. Compared to conventional overhang designs, the magnetic field can be shaped very evenly, which reduces distortions, especially for low frequencies and large strokes. Also, with this construction, the entire drive can hold more heat, the system is thermally stable and resilient. A weakness of such systems are often relatively weak driving forces. Audio Consequences succeded in this way by generating impressive 7.5 TM wich means a very healty value for a driver in this size and with a linear stroke of +/- 6.0 mm. All voice coils are wound from copper clad aluminum wire. This saves weight to the voice coil, so it can be used where it also brings a benefit - for the stability of the cones for example. 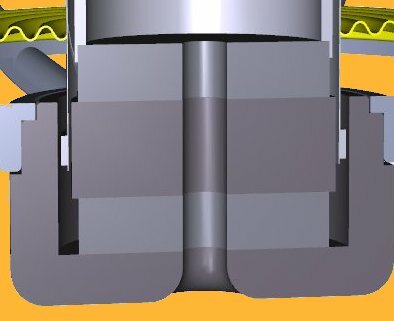 Wherever reasonable and necessary, ventilation holes are also placed within the engines, to avoid development of compression effects from the beginning. The electrical connection from the voice coil to the connection terminal is not, as usual, running on self-supporting and swinging leads, but by symmetrically strands woven into the spider. So it decreases the risk of broken strands substantially and the possibility that the strand strikes during the oscillation process to a different component is simply excluded. The axisymmetric way of the strands is guaranteeing a uniform load in the vibration axis. Finally, we thougt about the connection terminals: The usual flat plug contacts are useless in our view, in terms of quality of contact and long-term stability. Although they allow solder joints, by the ever more frequently used stronger supply lines, this means increasing problems caused by heat dissipation. In our view the best and most durable electrical connection is made through screw-down terminals. They can get very strong cables, creating a large contact area at high contact pressure and avoid unnecessary material transitions, because no lugs, tubes or plugs are needed. To be protected from corrosion even after decades, the contact surfaces are gold plated. Copyright(c) 2018 Audio Consequence. Alle Rechte vorbehalten.